The "corner stone" LP in ANY Record Collection!! All items here are GUARANTEED both ORIGINAL & AUTHENTIC, and each item comes with a LETTER OF AUTHENTICITY GUARANTEED for LIFE! My "extensive credentials" are provided here for your review (click here). but have not listed it yet...AND YOU will be the first to find out!!! All items sold come with our Letter Of Authenticity Guaranteed for LIFE! 1990's Reissue POSTER for The Beatles USA LP "Yesterday And Today. Features a Full Color Butcher Cover (STEREO VERSION) w/INCREDIBLE in RED letters along the TOP. Measures 18 x 22. A near EXACT image, excellent for framing, at a "fraction" of the cost! BUTCHER COVER "PROMO POSTER" - ORIGINAL from 1966! Capitol T 2553, FIRST STATE MONO BUTCHER COVER "STILL SEALED" (NEVER Opened!!! ), 1966, Incredible! Capitol ST 2553, PASTE-OVER STEREO BUTCHER COVER, 1966, Very Nice Condition! Capitol ST 2553, PEELED STEREO BUTCHER COVER, 1966, Very Nice Condition! We have other varying condition Butcher Covers available. Take a look! Please inquire! BUTCHER COVER "PROFESSIONAL PEELING SERVICE"
Since 1977, I (Gary Hein) have been professionally peeling Butcher Covers with consistent excellent results. Having peeled nearly ~2000 Butcher Covers to date, I am offering my Butcher Cover Peeling Services with a 100% Confidence Level (Many references are available upon request). There are only 2 individuals recognized worldwide for Professionally Peeling Butcher Covers, and I am one of them. The total cost (with shipping) is $550 for a Straight Peel with NO Restoration Services Performed (touch-up of areas from previous failed peel attempts, seam split repair, etc.) which are extra if needed. Typical turnaround time required to complete the peeling process is 8-10 weeks from the time I receive the LP Cover. Most of the Butcher Covers that I have peeled for clients have been RESOLD for OVER $1,500 once completed! Click Here to view our Beatles Website!!! 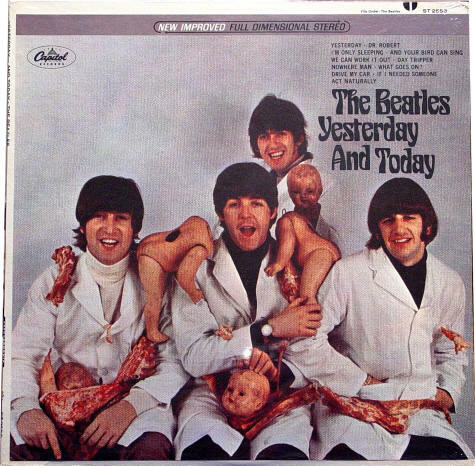 The Beatles BUTCHER COVERS offered here ARE ALL AUTHENTIC, and are NOT to be confused with the thousands of "COUNTERFEIT BEATLES BUTCHER COVERS" being sold on the "auction websites"! Because we stand by our merchandise, we offer a LIFETIME GUARANTEE LETTER OF AUTHENTICITY on all of our Butcher Covers. This is NOT the case with the "auction websites", where one can get STUCK with "INACCURATELY GRADED" or (even worse) "FAKE MERCHANDISE"! Unfortunately, the "auction websites" have become the DUMPING GROUND for much of the known counterfeits in circulation, including fake autographs, re-sealed LP's being advertised as being "still sealed", and Near Mint items that REALLY grade under "Professional Standards as only VG at best! The LATEST SCAMS now include the use of photos stolen from other websites showing a rare item being offered that the dealer simply DOES NOT HAVE....Guess what happens when you win the item? You receive an EMPTY BOX!!! The sender in these cases can PROVE that YOU RECEIVED the box, BUT YOU CANNOT PROVE that it was EMPTY UPON ARRIVAL!!! These are ALL TRUE FACTS! This is WHY you will see our "Security Feature" of a "dimmed" www.Beatles4me.com running through each photo. As they say in the business, you should only deal with "A Known Professional in the Industry for their Expertise". This especially applies when one is considering purchasing high dollar items.